I FINALLY got to check out Jurassic World. 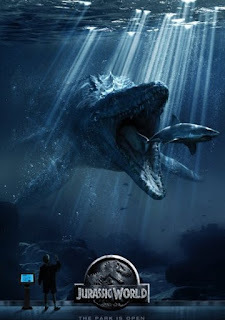 In a word, it is more of the same fun we've come to expect from Steven Spielberg's world of science created dinosaurs and the money they can make for the greedy corporate businessman. Directed by Colin Trevorrow (Safety Not Guaranteed), the film stars Chris Pratt, Bryce Dallas Howard, Ty Simpkins, Vincent D'Onofrio, Nick Robinson, B. D. Wong, and Irrfan Khan. Yes, the same B.D. Wong who was in the first film as a DNA science tech. Jurassic World takes place twenty-two years after the events we watched in Jurassic Park, on the same island, Isla Nublar. The new tourist attraction on the island has been in operation for ten years, and we're introduced to the story via a few quickie scenes of a dinosaur breaking out of an egg, a family sending two kids (AKA, the victims that need rescuing) to the park, the park operations manager, Claire (Howard) wrangling potential investors, the behind-the-scenes moments in the lab where all the dinosaur magic takes place, and then we're shown Owen (Pratt), the Veliciraptor expert and trainer. He's the man of the film. He's also the imprinted alpha to the four trained Raptors on the island. 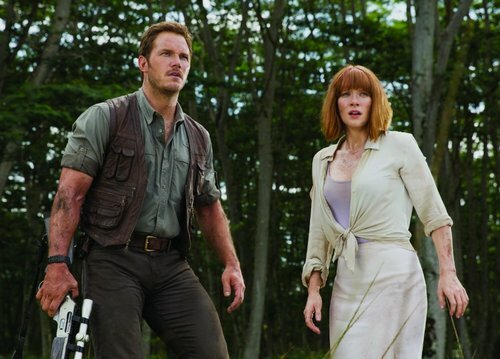 TIDBIT: What might also be interesting to know is that Jurassic World takes place, as if the sequels we saw between the first and this film never, ever, happened. It's the new trend of sequels these days... ignore all the other sequels and sometimes, even the source material. We see this huge Disneyland of Dinosaurs, where kids are riding baby triceratops in a petting zoo, tourists taking tours through fields of dinosaurs in special vehicles, and Sea World-like shows with giant prehistoric whales. And we learn that the park needs to come up with a new dinosaur every few years to spike interest in the attraction, helping the bottom line. It helps that the more teeth it has, the more money it brings in. 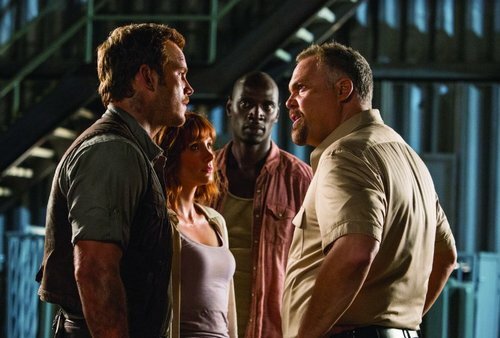 Enter the staff review of the newest, biggest and baddest attraction, the Indominus Rex. All hell breaks loose when the park manager is directed by the owner to have Owen review the holding pen for the new dinosaur. Owen notices something and... well, I won't spoil it, but can you figure out where it's going from there? There were a zillion "professional" reviews that trashed the depth of the characters in the film. Sure, there's not a ton of time spent to develop any of the characters because we're introduced to quite a few primary players, but they do just enough to show us some depth to most of them. But then again, who cares? Any one of them can become Purina Dinosaur feed at any second, right? But what we do know is that movie fans want to see dinosaurs again. We want to see them break out and eat people. We want to see what new lawyers or bad guys will get eaten? And how they end this newest "second" chapter. Metacritic gave the film a 59%, while Rotten Tomatoes, a 71%. IMDb, where film-goers rate movies, have given the film a 7.4/10. I'm inclined to agree with the (popcorn) 7 score from IMDb. It was fun to follow and see this new vision of the Jurassic Park franchise, but it didn't completely wow me. Sure, I think the money spent to see the film (In 2D), was not a waste. I'm not sure I would have been enthused if I dropped bucks on the more expensive large format or 3D version, but that's just my take. I'm sure some of the scenes could have been awesome in 3D, but then again, some of the scenes were so action oriented that I'm not sure how they would have panned out in 3D for me. Plus, how the movie is marketed and distributed, aka, number of 3D screenings and such, it is on its way to crushing all kinds of box office records. But at the moment, it has made nearly $1.3B worldwide. On the domestic box office chart, it has crossed into the 5th spot and will more than likely take over 4th this weekend. It has crossed into the 8th spot on the worldwide chart and will probably take over 7th by the end of the fourth of July weekend. - A non-egg thing were the rumors that Chris Pratt's character was the kid that was on the dig tour in the beginning of the first film. The one that the doc scared with the raptor claw in the desert. But no one ever pitched that in any marketing materials and I believe the rumors were debunked by the creative team. - The biggest and obvious egg was that the film was riddled with music from the original film. 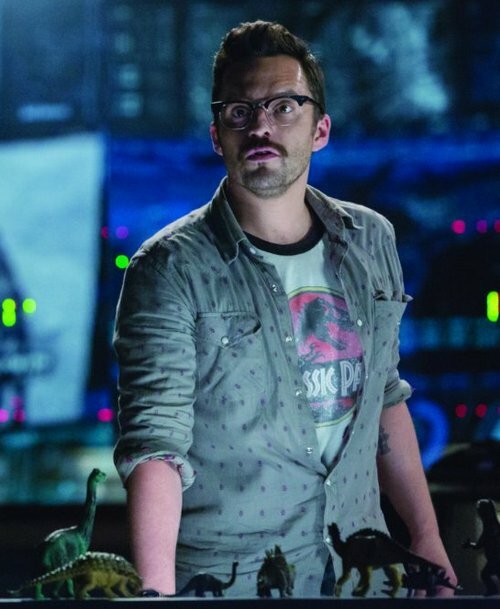 - Ian Maclcolm's book, "God Creates Dinosaurs,"makes an appearance, a nod to Goldblum's character's concerns from the first film. - There was some great vintage tee-shirts in a few shots. - I"m not sure if it's much of an egg, but the park's gates look very much like the old gates. - We catch a glimpse of the original Mr. DNA from the first film. - They're still using chained goats to entertain the guests. - They still use flares to get some of their "livestock's" attention. - See if you catch it when we discover the original visitor's center. - Not really an egg, but I love the continuity by the character of Dr Wu (B.D. WOng) being present at this park and having been associated with the first park. - There's a scene of a flock of Gallimimus‘ running past a tourist van, looking much like the flocking scene from the ogiginal. - We see jeeps from the original film. - We get to see a Dilophosaurus, the venom spitting small dino. - We got to see the night vision goggles from the original film. - We had a "dinosaur" in the mirror scene, but they didn't go overboard with making it a huge obvious reference. - InGen is still evil. - There was a great nod to the old black and white film, Lost World, which was an inspiration to Spielberg back in the day.